All successful businesses share one common trait: staying ahead of the competition. For businesses that rely on private jets to keep their top executives working efficiently in privacy and comfort, that includes keeping up with the latest trends in the private aviation industry. And some of the latest private jet industry trends transcend the typical corporate atmosphere — from helping animals in hurricane-torn areas and providing governments with insights to climate change to serving a new generation of wealthy Millennials who aren’t satisfied with the “old-school” ways of the private jet industry. The industry landscape is always changing and evolving to better serve the needs of a wide variety of clientele. Read on to discover how latest industry trends are revolutionizing private charter flight. Private jets aren’t just used to cart around suits and statesmen anymore. These days, a new generation of wealthy Millennials are looking to private jets to take the stress and discomfort out of travel. This new clientele isn’t satisfied with the old way of doing things when it comes to securing a private charter. Namely, they aren’t looking to call a business during 9-5 business hours to book a flight over the phone. New technology is serving a younger set of private air travelers by offering easy booking online. These booking services, like the one we offer here at Mountain Aviation, can also pick out empty legs of flights and offer customers discounted rates for those seats. On top of that, private air companies are getting into the app game, bringing an Uber-esque model to airplanes. With these new apps, travelers can put in their point A and point B and book a flight, just like that. 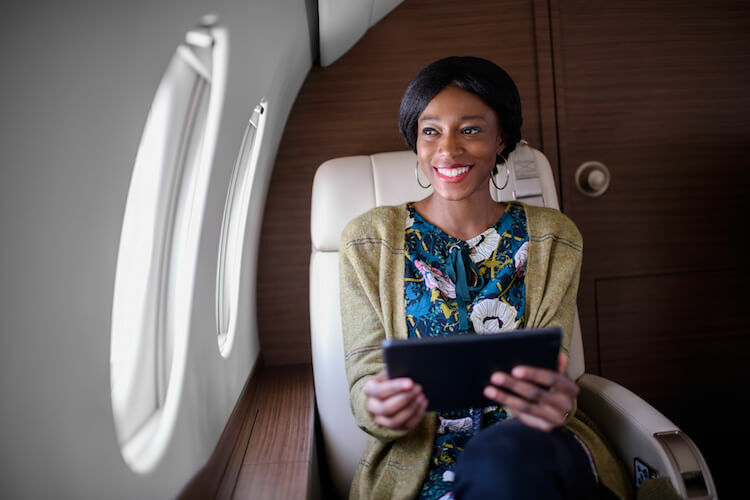 These technological advantages aimed at serving this new generation of customers are making private flight more accessible than ever. Increased accessibility with online and app booking has made the impossible seem possible for a new set of flyers. It’s not just wealthy Millennials joining the ranks of private air customers. Booking a seat on an empty leg can save discount flyers as much as 70% on a flight. And now, some private carriers are offering “shared flights”, in which you fly on a private jet but with strangers — think of it like carpooling, only way nicer. With these discount options, people who never imagined they could afford to fly private are now getting the experience when traveling on vacation, to destination weddings and for business. This expanding accessibility is increasing the overall demand for private charter flights. AviationPros reports that demand for charter flights is on the rise around the globe, and now account for a majority of private flights in Europe, coming in ahead of the number of flights flown by private jet owners. The takeaway? You don’t have to own a private jet to enjoy the added convenience, comfort, and safety of flying on one. If you do own a private jet, the good news is that ownership is easier than ever. That’s due to the increased role that aircraft management companies are playing in helping owners see to the details of staffing, maintenance, documentation, and use of their craft. Safety regulations from the FAA are on the rise, and the IRS asks a lot of businesses with private jets to properly document use for deduction purposes. That’s where aircraft management companies come into the picture. At Mountain Aviation, for example, our team of experienced professionals can handle every step of the process of finding an acquiring a new jet to staffing, maintaining, storing, and flying one you already own. Plus, when you aren’t using the aircraft, we can manage the selling of seats for charter flights on your jet to offset the cost of ownership, making the idea of owning your own plane all the more lucrative. As private aviation becomes more complex, it helps to have experience on your side. One of the main people love going on cruises is the all-inclusive guided travel to tropical island locales or to Mediterranean coastal cities. Now, private jet companies are doing the same thing. Imagine loading up on a customized 757 that has just 50 seats (compared to commercial models that have over 200 seats) that fold down into beds and setting off for a tour around the world. That’s just what some forward-thinking companies are now offering. These programs include a totally customized itinerary, so your travels aren’t tied to the cumbersome schedules (and lack of legroom) offered by commercial airlines. For example, you can see in 12 days what it would take you 15-16 days to visit on commercial flights. Some people think flying private is a luxury reserved only for the wealthy. But in addition to expanding accessibility to more flyers, recent trends are also pushing private aviation into the territory of philanthropy. Private planes can get to more remote locales and travel faster than commercial airlines. And since they’re privately owned, they aren’t tied to the almighty dollar like the big commercial companies are. That flexibility has allowed private jet owners to use their aircraft for good. Medical missions to underserved, remote locations. International disaster aid, including helping animals. Increasing quality of life for disabled, veterans, and third-world populations. As you can see, with recent trends in private aviation, it’s not just the wealthy who get to enjoy the service of private flight. Lower prices and philanthropic uses are making private jets more relevant than ever. Plus, increased customer demand and safety rules mean that flying private is safer than ever, too. Mountain Aviation, for example, has a long track record of safety in the private sector. We’ve achieved the coveted ARG/US Platinum Rating. This prestigious rating covers every facet of Mountain Aviation’s flight operations and is one of the highest ratings for “safety and excellence in service” the aircraft industry can bestow. That’s why you should look no further than Mountain Aviation for booking your next private charter flight, whether it be for business or pleasure.